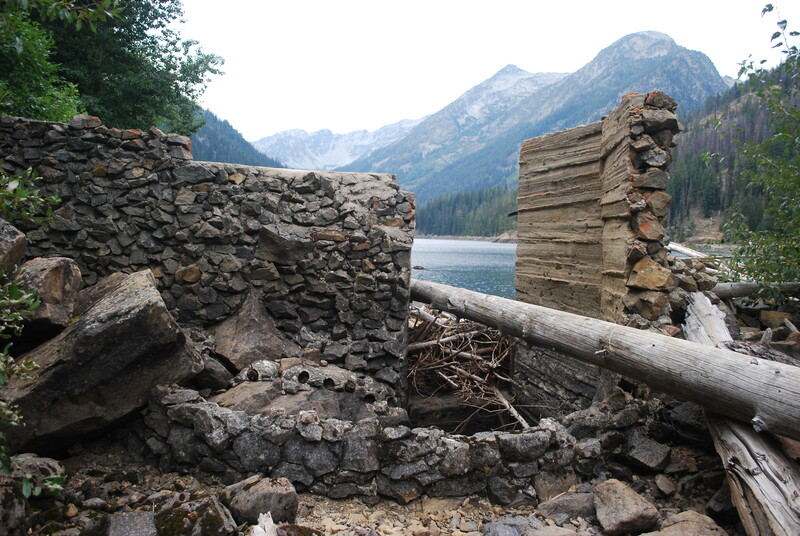 Part 2: New Dams & Diversions in the Alpine Lakes Wilderness? This is the second of a four-part series regarding proposals to re-build a dam and increase water diversions from as many as seven lakes in the Enchantment Lakes region of the Alpine Lakes Wilderness. Part 1 describes the genesis and functioning of the Icicle Work Group, the entity which is proposing the water projects. Part 3 examines the Upper Klonaqua Lake Pipeline proposal, and Part 4 examines the Alpine Lakes Automation-Storage project. In a nutshell, the Department of Ecology’s Office of the Columbia River has funded Chelan County to investigate how to solve water problems in the Wenatchee River watershed. The primary focus of the effort is to increase water storage and diversions from seven lakes in the Enchantment Lakes region of the Alpines Lakes Wilderness. 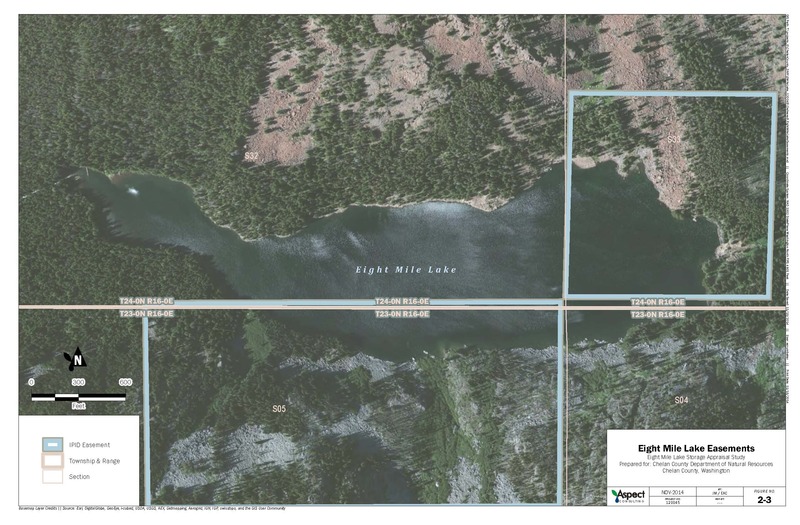 This article discusses the proposal to rebuild a dam at Eightmile Lake and make more water available for the City of Leavenworth and other downstream uses. 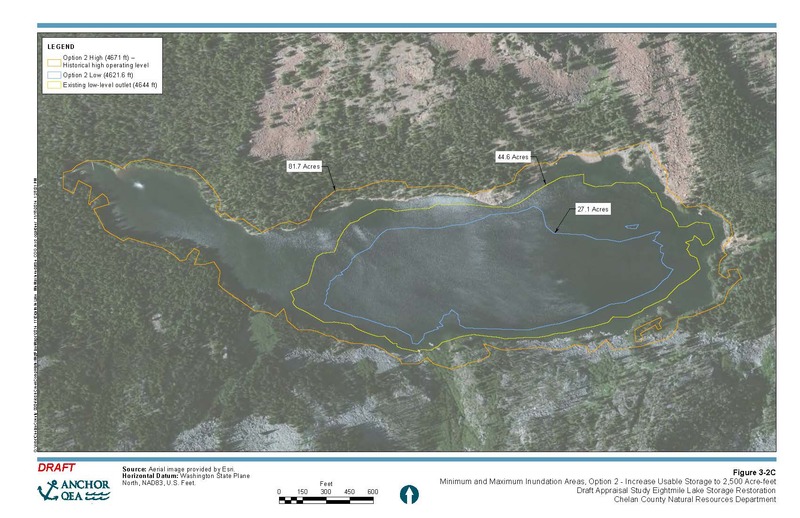 The Eightmile Lake Restoration-Storage proposal evaluates the ability to increase water storage in Eightmile Lake by increasing the pool level and/or drawing the lake down further. The original dam and control works for the lake have collapsed and current usable capacity is 1,375 acre-feet of water. The Eightmile Lake Restoration Draft Appraisal Study (Nov. 2014) evaluates four options for increasing storage capacity: 2,000, 2,500 (2 options), and 3,500 acre-feet. All four options include re-building the dam to its original height, or higher, as well as drawing down Eightmile Lake pool below its current, semi-natural outlet. The Eightmile Lake proposal is based on assumptions about water rights and easements held by the Icicle and Peshastin Irrigation Districts (IPID), which actively manage four of the Alpine Lakes to serve water to about 7,000 acres of orchards and converted lands in the Wenatchee Valley. IPID holds water rights dating from 1926 that allow the district to store water in and divert from the lakes. The Eightmile Lake water right was adjudicated in 1929 at 2500 acre-feet annual volume, and 25 cfs rate of diversion. However, the Eightmile dam collapsed at some point in the past and IPID has not used the full (artificial) storage capacity for many years. There are questions about relinquishment of water rights over and above what IPID needs and has used in the past. At a minimum, the Department of Ecology would have to issue water rights for new and increased uses. 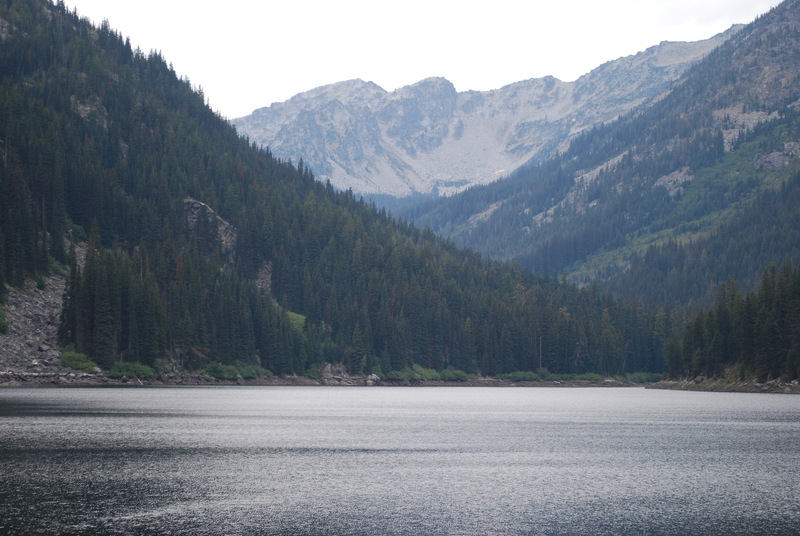 IPID holds easements that allow it to “store” water in several of the Alpine Lakes, although the scope of the easement for Eightmile Lake does not cover the entire lake. As described in a Review of Eight Mile Lake Storage Authority (Aspect Consulting, 3-5-14), IPID’s easements cover only a portion of the lake. Any increase in storage capacity would require, at a minimum, U.S. Forest Service approvals. Section 4(d)(4) of the Wilderness Act of 1964 requires Presidential approval to establish and maintain reservoirs within wilderness areas. The Eightmile Lake proposal raises questions about the scope of impacts on riparian zones and wilderness surrounding the lake, including trails, campsites and other public amenities. Trout Unlimited has published a study evaluating increase in storage at Eightmile Lake to provide water to improve instream flows in Icicle Creek. That study includes a brief review of impacts to campsites and trails around the lake. Eightmile Lake is one of the most popular trails and destinations in the Icicle Creek region of the Alpine Lake Wilderness, partly because of its easy accessibility. To date, however, the U.S. Forest Service has not provided a public position regarding proposals to expand or draw down Eightmile Lake. Categories: Icicle Creek, Instream Flows, Salmon, Western Water Law | Permalink. 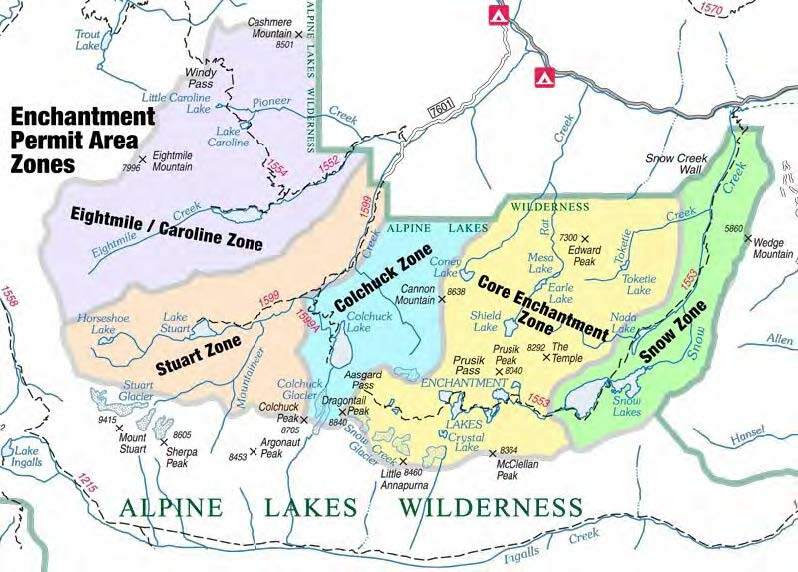 New Dams & Diversions in the Alpine Lakes Wilderness? The Department of Ecology’s Office of the Columbia River is funding and sponsoring proposals to increase water diversions from seven lakes in the Enchantment Lakes region of the Alpine Lakes Wilderness that flow into Icicle Creek: Colchuck, Eightmile, Upper and Lower Snow, Nada, Upper Klonaqua and Square Lakes. 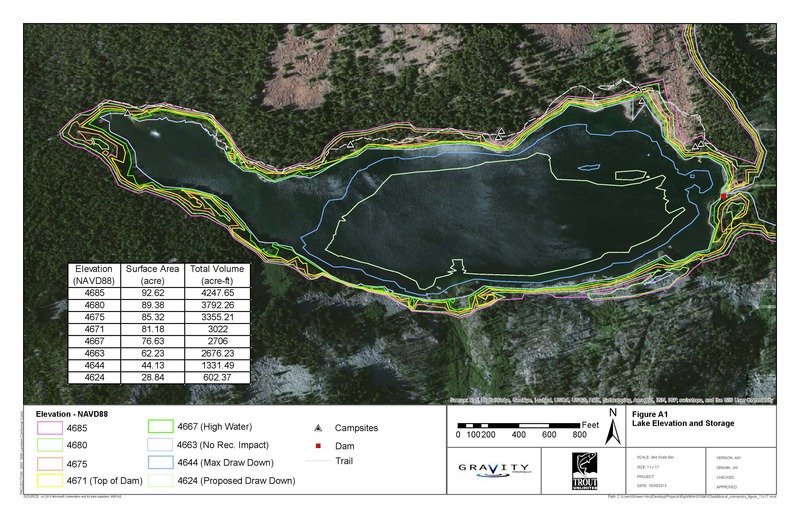 This post is Part 1 of a 4-part Naiads series describing the Alpine Lakes proposed projects. Part 2 discusses the Eightmile Lake Restoration-Storage project. Part 3 discusses the Upper Klonaqua Lake pipeline proposal. Part 4 discusses the Alpine Lakes Automation-Storage project. In 2012, the Office of the Columbia River funded Chelan County to form a “collaborative work group” to address Icicle Creek water quantity issues. Ostensibly the purpose of the Icicle Work Group (IWG) is to solve instream flow problems in Icicle Creek while obtaining more water from the system for out-of-stream uses. The impetus for creating the work group comes from a lawsuit filed by the City of Leavenworth against the Department of Ecology regarding its quantification of the city’s water rights. The Chelan County Court decision was issued in 2011. The case is on hold in the Court of Appeals while Ecology uses the IWG process to attempt to find water for Leavenworth (see Settlement Position Paper, Initial Status Report, 2nd status report and 3rd status report). If the effort fails and the lawsuit moves forward, a court decision could undermine Ecology’s authority to quantify water rights that pre-date the 1917 water code. The statewide implications are substantial; presumably Ecology would prefer to settle and vacate the lower court orders. To implement the Leavenworth settlement efforts, the Office of the Columbia River entered into a $700,000 contract with Chelan County Natural Resources Department to run the IWG and pursue water development projects. Chelan County subcontracted with Aspect Consulting (Dan Haller, principal) for $506,000 of investigations and Dally Environmental Service (Lisa Dally Wilson, principal) for $16,000 of meeting facilitation. Also subcontracted is Cascadia Law Group (Jay Manning, principal) ($$ unknown) and the Icicle Peshastin Irrigation District ($25,000 per year for two years). In addition to finding water for Leavenworth, the IWG process has several goals embodied in its Operating Procedures. These include improving instream flows in Icicle Creek, helping create a sustainable Leavenworth National Fish Hatchery, protecting tribal rights to fish at the hatchery, improving water reliability for agriculture, and improving ecosystem health. All this must occur while achieving compliance with state and federal laws, including the Wilderness Act – no small feat. The IWG is a “quid pro quo” process. This raises the question whether ecosystem benefits, including water quality improvements and restoration of instream flows for endangered species, may only be achieved if new water supply is provided for Leavenworth (along with other IWG goals). This in turn raises questions about whether and to what extent state and federal laws (for example, Clean Water Act and Endangered Species Act permits) may be superceded by a stakeholder-based collaborative process. What is the role of the Department of Ecology and NOAA Fisheries, agencies who are tasked with issuing permits for the Leavenworth Fish Hatchery, for example? According to IWG studies, the primary source of water supply for new municipal/domestic/agricultural uses will come from the seven lakes in the Alpine Lakes Wilderness. At present, three proposals relate to the Alpine Lakes: (1) the Eightmile Lake Restoration-Storage project; (2) the Upper Klonaqua Lake pipeline proposal; and (3) the Alpine Lakes Automation-Storage project. These projects are discussed in Parts 2, 3, and 4 of this series. The latest studies can also be found on the Chelan County NRD website. The Icicle-Peshastin Irrigation District (IPID) holds grandfathered easements and water rights that allow it to store and divert water from the Alpine Lakes. Leavenworth Fish Hatchery (owned by US Bureau of Reclamation, operated by US Fish & Wildlife Service) also holds a water right for Snow & Nada Lakes. The scope of these interests is a matter for evaluation as well. Rather than divert additional water from the Alpine Lakes Wilderness, water solutions for Icicle Creek could be found through more sustainable approaches. Approximately 117 cfs of new instream flow could be added to a 6-mile length of Icicle Creek (downstream of Snow Creek) by moving the Icicle Peshastin Irrigation District’s take-out point downstream to the Wenatchee River. Water conservation opportunities are substantial. Rather than looking to the Alpine Lakes as the first option, the City of Leavenworth should adopt an aggressive water conservation plan, as should other users in the valley. These actions, combined with promoting water markets that facilitate selling and trading water rights, could supply future water uses. However, these approaches have received minimal consideration to date. Manipulating lake levels and allocating new water rights from the Alpine Lakes is likely to impact the public’s interest in the Alpine Lakes Wilderness, and could be controversial. Although the IWG was asked to create a Wilderness Advisory Group to solicit immediate input on these proposals, that idea was eliminated without discussion at the Dec. 2014 IWG meeting. Chelan County did hold a public meeting in Seattle in 2012, from which the perception arose that the environmental community is not concerned about the Alpine Lakes water storage and diversion proposals. A similar meeting may be held in January 2015. Meanwhile, scoping under the State Environmental Policy Act (SEPA) will be scheduled for spring or summer 2015. National Environmental Policy Act (NEPA) processes are unknown at this time. In addition to the Alpine Lakes storage and water right proposals, the Icicle Work Group is evaluating several other projects to improve instream flow and habitat in Icicle Creek. There is also movement afoot by other water users in the Wenatchee Valley to capture Icicle Creek (including Alpine Lakes) water for downstream uses. The ultimate “package” of projects will involve trade-offs that require public scrutiny and input. For more information about the Icicle Work Group, see the Chelan County website, and read Parts 2, 3 and 4 of this series. Categories: Icicle Creek, Instream Flows, Salmon, Wilderness | Permalink.